Empty Heat derives from Yin deficiency and the two pathological conditions (Yin deficiency and Empty Heat) are often considered as one. All modern Chinese books include Empty Heat clinical manifestations under the patterns of Yin deficiency. For example, under the pattern of Lung-Yin deficiency they will have dry throat and dry cough (Yin deficiency) and 5-palm heat (Empty Heat). This is not the case in practice as Yin deficiency may last a long time without symptoms or signs of Empty Heat: thus, Yin deficiency and Empty Heat are two separate pathological conditions, even though, of course, the latter derives from the former. The symptoms of Yin deficiency vary according to the organ involved but generally they will include night-sweating and symptoms and signs of dryness such as dry throat, dry cough, dry lips, dry eyes, dry mouth, thirst with desire to drink in small sips, tongue without coating possibly with cracks. The symptoms and signs of Empty Heat will include feeling of heat (that is worse in the evening), 5-palm heat (a feeling of heat of palms, chest and soles of feet), malar flush, low-grade fever, a red tongue without coating and possibly a rapid pulse. The tongue shows conditions of Yin deficiency and Empty Heat clearly. It is important to understand that, although Empty Heat derives from Yin deficiency, it takes time for it to develop. Therefore, a patient may display all the signs of Yin deficiency on the tongue for several years without developing Empty Heat and the tongue shows this clearly by lacking a coating (Yin deficiency) but being of a normal colour (no Empty Heat). In fact, Yin deficiency manifests on the tongue with a lack of coating; therefore, a tongue without coating but of a normal body colour indicates Yin deficiency without Empty Heat. 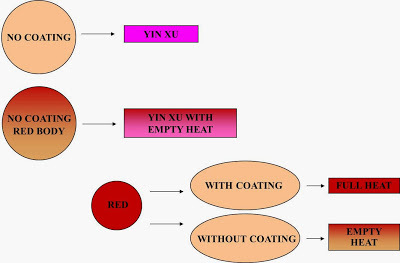 As Yin deficiency aggravates with time, Empty Heat may develop and this turns the tongue red: therefore Empty Heat on the tongue is manifested by a red body colour together with the absence of coating. One often hears that “in Yin deficiency the tongue is red” (a statement that is tempting to make since “in Yang deficiency the tongue is pale”). This is not so: in Yin deficiency, the tongue lacks a coating; in Empty Heat, the tongue lacks a coating and it is red. A tongue without coating indicates Yin deficiency first and foremost of the Stomach: in addition, it may also indicate Yin deficiency of the Kidneys, Liver or Heart. 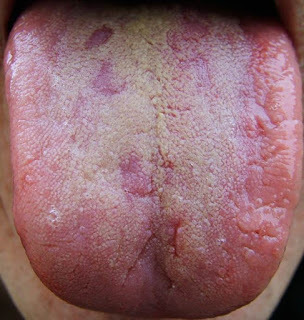 That Yin deficiency can occur without Empty Heat is demonstrated by tongue diagnosis as many patients have a tongue that lacks a coating (indicating Yin deficiency) but is not red. Yin deficiency and Empty Heat are not formed in a short space of time: it takes years from them to develop (the only exception is the Yin deficiency and Empty Heat that may form in an acute way during an invasion of Wind-Heat with Heat penetrating into the Interior). The tongue shows clearly not only the present condition but also the stage it is at: it therefore also shows where it is developing from and what it may lead to. Empty Heat may develop at any of these stages but it is more likely to develop at the third when the tongue has no coating and it is red. That Yin deficiency and Empty Heat are two separate pathological conditions is clear also from herbal medicine. In fact, the herbs and formulae that nourish Yin are in a separate category than the herbs and formulae that clear Empty Heat. For example, Mai Men Dong Tuber Ophiopogonis japonicis and Tian Men Dong Tuber Asparagi cochinchinensis nourish Yin but they do not clear Empty Heat. Qin Jiao Radix Gentianae Qinjiao and Qing Hao Herba Artemisiae annuae clear Empty Heat. When there is Empty Heat of course one combines herbs that clear Empty Heat with those that nourish Yin.